01:20 am: St Patricks Day! Today's Megatokyo totally cracked me up. It doesn't do that as often as it used to, but I still love it. I believe it shifted from more humour to plot-based story when Fred Gallagher took over Megatokyo completely from Rodney Caston a couple years ago. There used to be more of a chaotic element I really liked and I think Rodney was the cause of it. He gave it more of an edge and would send things flying off in another direction without warning. His character was a bit different too. We got to see more quirks that weren't important to the plot (yes, that's ramen he's pouring milk over.) Things you had to look for to see. But despite the changes, it's still my favourite web comic. Fred Gallagher's artwork is wonderful and I never tire of the sketchbook feeling. I am proud to have an original on my wall and hope to have more someday. Nothin' is gonna keep me from going to the Acen auctions again this year. 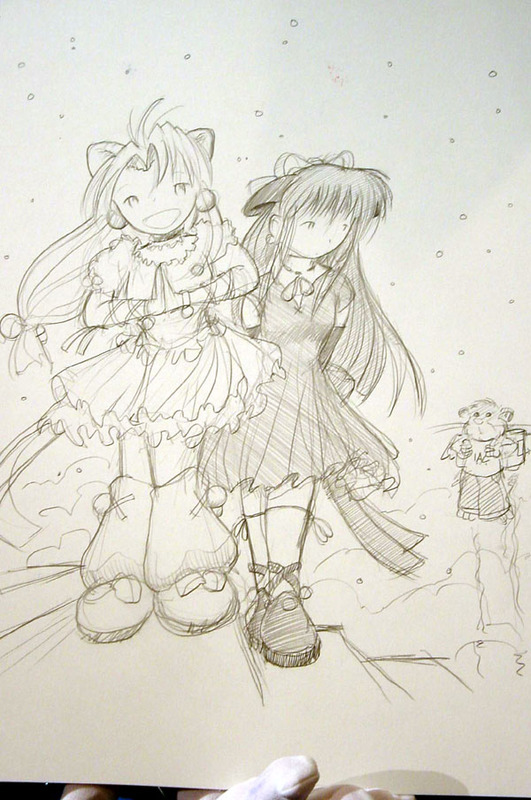 For anyone who is not a regular reader of Megatokyo to understand the comic that I enjoyed so much, you have to know a bit about the characters, and have seen this strip and the next one. Even still, it helps to be a fan. Anyway, I post these links mainly as a reference for myself because I've been anticipating this for a week or so now and it took a while to find the strips in the growing archive of more than 500. I've been planning to do a long Megatokyo rant for a while with extensive linkage, but this isn't it. Today's strip was just too good to not comment on. Tomorrow (remember, I write these in the middle of the night so when I say "tomorrow" it usually means "today, after I've fallen asleep and woken up again")... tomorrow is St. Patrick's day! I'm not big on the spread of Christianity but I like an excuse to wear green and eat corned beef and cabbage. Plus, this is turning into another Hallmark holiday anyway so no harm done. For lunch Dad and I are going to the local VFW for the aforementioned foodstuffs which are much better than they sound. For years I was appalled at the mere mention of cabbage, but when I actually tried it last year on the 17th, much to my surprise I actually liked it! Well, at least the way they prepared it. So again, I will go, as always, I will deck myself in green, and maybe, just maybe, I'll get that emerald I worked all weekend for.